Whenever I want to discover some new music these days I got to 1 of 3 places; Amazon, Wikipedia and Last.FM, in that order. Amazon has got perhaps the most useful database of user reviews on the web. Eg, most of them are actually half-coherent. Amazon also shows associated artists which are useful because once you start following links you can be on there all day discovering new artists. Wikipedia is great for finding out the background and biography of bands and Last.Fm is sometimes useful as well. I know it should be the most useful of all, but for me personally it rarely recommends anything that I a) either haven’t heard before or b) like. This week Amazon and IMBD joined forces and launched the oh-so catchy SoundUnwound online database for music (trying typing that in the address bar fast). Oh and it’s a beta, but that’s a given right? What I like about it is the fact it’s dedicated music database, it’s hardly original but it differentiates itself from Wikipedia somewhat. 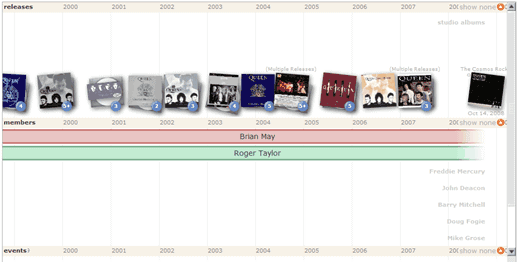 It’s still editable by anyone and includes a number of other interactive and fairly cool features such as the discography timelines for artists below. The sit also has the safeguard in place of all edits made by users first being approved by Amazon employees. I think this is a good idea as long as it’s prompt. From having a bit of look around however there isn’t a huge amount here not already available on other sites like AMG or Amazon’s main site itself. In fact the best thing about Amazon was even included on UnwoundSound – the user reviews. I have absolutely 0% interest in reading someone’s “shout-out” to the Beatles, but I would like to read their review of them. Incidentally someone needs to invent some ‘genre-standards’ for music. Frankly as they are right now they’re useless, if we could decide on a specific set of genres and then use them across all music software and databases perhaps they could actually be useful. I agree with you on SoundUnwound. It’s a bit skimpy right now. I also go straight to Amazon when I want to check out an artist or group. I also use FoxyTunes Planet which aggregates information from a variety of sources including wikipedia, last.fm and YouTube. Here here on the comment about genres. Especially in the heavy metal field. There are a million different genres. Metal, Death Metal, Brutal Death Metal, Grindcore, Gore Grind, Math Metal, Power Metal, Power Violence, Folk Metal and so on and so forth. good find, Martin. i usually use Amazon but it’s always a bit slow and awkward when trying to explore music. this new one really works a lot better. and they have some fairly good album art as well. good stuff! I’m not sure how many genres you could break it down into… but metal for example could probably be divided into 4 or 5 major ones. SoundUnwound is superior to Discogs in that it has music samples via Amazon. It also has a nicer layout than MusicBrainz. As such it may be a better experience.